So, it’s been eight days. Eight days since I met with the beit din and was found sincere in my goal of Judaism. Eight days since I made my formal declaration while holding the Torah. Eight days since I immersed in mikveh and sang out the Shema in a voice that shook. Eight days since I became a Jew. 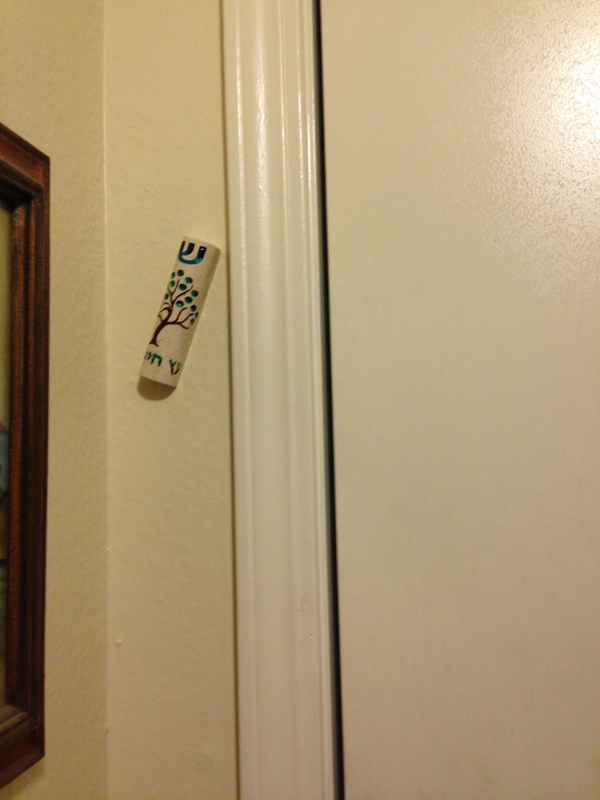 In those eight days, we’ve gone to Saturday morning Torah study, Saturday morning Shabbat services where I was called up to be recognized by the entire congregation as a new Jew, Havdalah on Saturday night followed by the mounting of our first mezuzah inside our front door, and our final Hebrew class. At Torah study, my husband made an observation about the Torah portion – are we supposed to seek out the person whose goods we have found? – that led Rabbi to say “And this is why [Husband] will be a rabbi someday.” When I wrote about Ki Teitzei, which was the Torah portion of the week I became a Jew, here in my blog, that d’var Torah was based on what I said in the Torah study session and what I said to Rabbi afterwards, specifically the interpretation of why we should blot out Amalek and yet never forget. Now, for those who have the chumash open, I want to point out something that I discovered in reading the Torah portion to this week that I never really paid attention to. If you look at verse three, the last phrase there is “You must not remain indifferent.” Hebrew is very interesting. The last word there- mechit aleim – that is the verb being translated here as “to remain indifferent.” But the verb in Hebrew comes from the verb “alam,” or “to hide or conceal.” And the form of the verb here is reflexive, so it literally means “Don’t conceal yourself. Don’t hide yourself.” So the notion here, at least in the Hebrew, is that when we avoid helping others, we are concealing ourself from the world. We are hiding. And that goes back to one of the first lessons in all of Torah, the incident in the Garden of Eden, when Adam and Eve hid in bushes because they had not lived up to their responsibilities. So our tradition here in this Torah portion is reminding us that to the extend that we involve ourselves in caring about others, we bring ourselves more fully out into the world. Otherwise, all we’re doing is hiding. With the Torah out and with this message of taking greater responsibility for who we are, and caring for the world before us and resonating, I’d like to call forward at this point someone who has assumed increasingly greater and greater responsibility for himself and the world around him, who just on Thursday immersed himself in mikveh as part of the process of emerging as the Jewish person that he has always been. And then he called me forward. I wasn’t quite surprised, but what he said there was profound to me. He tied my journey to the Torah portion. To me that was a really big deal. Then he and the cantor sang in Hebrew (and said in English) a blessing on me, which is the same blessing said on new b’nei mitzvot, the Birkat HaKohanim. May Adonai shine his face upon you, and be gracious unto you. May Adonai lift his face toward you and give you peace. I’m not going to deny it – it was a powerful moment. And yes, I did tear up a little bit. The words on the bottom spell out “Eitz Hayyom,” or “Tree of Life,” which I love. It’s on the inside of the door, but on the right-hand side as you enter (best we could do; we aren’t allowed to put it on the outside of the door in our apartment building) and it leans inward towards the main room of the house. Hebrew class on Wednesday was also powerful, because we were able to bring the Torah out of the Ark and look at it up close in the classroom. All five of the class members read from the actual Torah scroll, including me and my husband. Everyone got the chance to carry it or do something else with it, although my husband asked to not hold it until his day comes on October 1st, and the teacher encouraged me to put on my tallit. I was the one who got to carry it back to the Ark afterwards. The class was more a Judaism class than a Hebrew class. Afterwards, we all had a potluck. The teacher says she has a gift for me, and it was just a really meaningful way to wrap up my first seven days of being a Jew (since, you know, when sundown came it was technically 19 Elul, one week after the Big Day. And today my best friend and I did our traditional erev Shabbat errands, got congratulated by the baker, and got reminded about crown challah for Rosh Hashanah. It’s been an interesting first week of Judaism. Long may this continue.